The measures are part of a wave of legislation dealing with e-cigarettes and other vaping devices currently being considered in statehouses across the country, despite the fact that those devices are regulated by the federal government. Many of the state measures, like the proposed bans on flavored tobacco products, are aimed at curbing skyrocketing e-cigarette use among teenagers, which has also been a recent focus of federal regulators. E-cigarettes have been subject to federal regulation since 2016. In August of that year the Food and Drug Administration finalized a rule extending its regulatory authority over cigarettes and smokeless tobacco to encompass all tobacco products, including e-cigarettes and other electronic nicotine delivery systems like e-hookahs, vape pens and vaporizers. The rule also prohibited the sale of the newly regulated tobacco products to those under the age of 18. Last year the FDA initiated a crackdown on sales of e-cigarette products to minors, which included the largest coordinated enforcement action in the agency’s history, resulting in the issuance of over 1,300 warning letters and fines for online and brick-and mortar retailers nationwide. The agency also stated that it intended to continue its stepped up enforcement effort “indefinitely” and that it had directed manufacturers of the top-selling e-cigarette brands to submit plans for addressing youth access to their products or risk having them removed from the market. FDA Commissioner Scott Gottlieb, M.D. said the agency was “committed to advancing policies that promote the potential of e-cigarettes to help adult smokers move away from combustible cigarettes,” but it also saw “clear signs that youth use of electronic cigarettes has reached an epidemic proportion,” necessitating an adjustment of the agency’s strategy. Manufacturers of e-cigarettes have promoted them both as a safer alternative to conventional cigarettes and a way to help smokers quit. And the FDA actually allowed the sale of the devices without manufacturers having to first prove they provided a net public health benefit. The jury is still out on whether they are either safer than regular cigarettes or an effective smoking-cessation aid, and no e-cigarette maker has yet sought FDA approval for its product. Meanwhile, between 2011 and 2018, e-cigarette use among middle school students increased 716.7 percent (from 0.6 percent of their total number, or about 60,000 students, to 4.9 percent, or about 570,000 students), according to a report from the Centers for Disease Control and Prevention. Among high school students, e-cigarette use rose 1286.7 percent (from 1.5 percent of their total number, or 220,000 students, to 20.8 percent, 3.05 million students) over the same period, the CDC report said. In response to those surging teen usage rates and the FDA’s threatened ban, JUUL Labs, maker of the sleek, USB flash drive-like JUUL device, which commanded 75 percent of total e-cigarette sales as of October 2018, announced in November that it was suspending sales of its Mango-, Fruit-, Creme-, and Cucumber-flavored “pods” at the 90,000-plus retailers that carry its products, making them available only on its website, which restricts sales to those 21 and older. And in March came the surprise announcement that Gottlieb was resigning from the FDA, creating uncertainty about the agency’s position on teen vaping and other issues going forward. “We believe his resignation calls into question whether or not the FDA will in fact enforce harsher regulations around youth e-cig usage/access, cig nicotine limits and a cig menthol ban given he was the champion behind these initiatives,” Bonnie Herzog, managing director and senior beverage, personal care and tobacco equity research analyst at Wells Fargo Securities, stated in an email to clients, according to a report by the New York Times. This month, however, the FDA announced it has seen “a recent uptick” in reports of seizures associated with youth e-cigarette use, signaling “a potential emerging safety issue.” Although the agency stressed in another statement that it didn’t “yet know if there’s a direct relationship between the use of e-cigarettes and a risk of seizure,” the substantiation of such a connection would presumably constitute a compelling reason for it to take further action on e-cigarettes. But regardless of what happens at the federal level, new e-cigarette laws are on the way in the states. 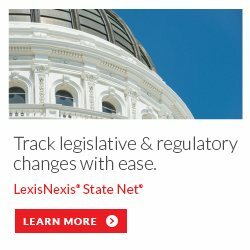 As of April 9, at least 175 measures dealing specifically with e-cigarettes and other vaping devices had been introduced in 40 states, according to LexisNexis State Net’s legislative tracking system. The measures include proposed taxes on those products, as well as restrictions on their promotion and sale, particularly to minors, and the use of the products in public places, such as schools. A dozen of the bills had already been enacted, including Illinois HB 345, Utah HB 324, Virginia HB 2748 and Washington HB 1074, all of which prohibit the sale of e-cigarettes to those under the age of 21. As of last December, six other states - California, Hawaii, Maine, Massachusetts, New Jersey and Oregon - had already raised their minimum legal sales age for e-cigarettes to 21, according to the Public Health Law Center. As of last week, at least 10 states had also introduced bans on the sale of flavored tobacco products (see Bird’s Eye View). Most of those proposals would exempt establishments that prohibit minors. Some would apply only to e-liquids used to refill vaping products. But legislation introduced in California - where more than two dozen cities and counties, including San Francisco, have already approved restrictions on the sale of ﬂavored tobacco products - had no such exclusions. One of those bills, SB 38, was approved by the state’s Senate Health Committee last month. And one of the measure’s strongest supporters on that panel was Sen. Jeff Stone, a Republican from Riverside County. Bucking the general inclination of his party, which receives substantial financial backing from tobacco giant Altria, Stone took aim at that company’s acquisition of a 35 percent ownership stake in JUUL for $12.8 billion last year. The issue is personal for Stone, who told CALmatters’ Dan Morain that his mother, who died at the age of 52, had been addicted to cigarettes. “We look forward to working with the California Legislature in the coming months,” he said. California’s Legislature isn’t the only one the company will need to work with this session. At least one other state, Hawaii, is considering measures similar to California SB 38, one of which, SB 1009, has already been passed by its originating chamber. The House version of that bill, HB 276, was amended to exempt menthol-flavored tobacco products, because menthol cigarettes provide $30 million in revenue for ambulance services and a hospital trauma center, according to the chairman of the House Health Committee, Rep. John Mizuno (D), as the New York Post reported. Still, Scott Rasak, vice president of sales for VOLCANO Fine Electronic Cigarettes, which has stores on three of the state’s islands, suggested the ban would push “75 percent of the adult vaping community back to smoking cigarettes” and “annihilate” independent retailers. The future growth of the whole tobacco industry could take a hit from bans like those proposed in California and Hawaii, as well as the other e-cigarette legislation enacted or pending in the states. Global cigarette sales, valued at $604.35 billion in 2015 by one estimate, dwarf those of e-cigarettes, valued at $13.9 billion in 2017. But a cumulative annual growth rate of 2.8 percent has been forecast for the former from 2016 to 2021, while a CAGR of 19.6 percent has been forecast for the latter from 2018 to 2023.